At the end of April the UN Security Council renewed the MINURSO mandate for just 6 months. This positive change shows support for the Special Envoy, Koehler, giving him a chance to make progress in breaking the stalemate if Morocco agrees to direct negotiations without preconditions. The successful court cases brought in South Africa and the European Court to protect Saharan phosphates, produce and fish show that going to court to enforce international law is the way forward and the way to end 'business as usual' which entrenches the occupation. These successful cases also highlight, however, the continuing failure of the UN Security Council to uphold its ‘sacred trust’ to protect the resources of the people of the non self governing territory of Western Sahara. In the lead up to UNSC discussion of the renewal of the MINURSO mandate Morocco again followed its strategy of diverting international attention away from its continued failure to engage with the referendum process, its continued abuse of human rights and pillage of Saharawi resources. This year Morocco engaged in a media and diplomatic campaign of misinformation alleging that the Frente POLISARIO had violated the terms of the 1991 UN-supervised ceasefire. In a letter to WSCUK, the Polisario Front have thanked and congratulated WSCUK and our lawyers Leigh Day for our court case result. New York, April 30, 2018 (SPS) - The resolution extending the mandate of the United Nations Mission for the Referendum in Western Sahara (MINURSO) by six months represents a turning point in the handling of the Sahrawi issue by the Security Council, said M’Hamed Khadad, the Saharawi coordinator with MINURSO. “It is a turning point in terms of the interest attached by the Security Council and international community to the solution of the conflict,” Khadad told APS. “The votes of the majority of the Security Council’s members are in the right direction, support the efforts of the UN Secretary General’s personal envoy and call to the implementation of the Council’s resolutions reaffirming the right of the Saharawi people to self-determination,” he added. The emissary Horst Kohler will take advantage of the six-month period to put back negotiations on the rails, said Khadad. The international camel research network ISOCARD has instructed its Moroccan partners to move the location of its upcoming conference from Western Sahara to Morocco. ISOCARD, the International Society of Camelid Research and Development, had earlier this year announced that it was hosting its triennial conference in El Aaiun, the capital city of occupied Western Sahara. The conference had invited its 260 members for a programme with renowned international camel experts as speakers. WSRW on 27 March contacted the organisation, requesting the conference be moved to a city in Morocco proper. WSRW asked whether the organisation had been aware that its Moroccan partners was planning to host the conference outside of the international borders of Morocco. ISOCARD has now replied that it has instructed its Moroccan partners to change the location of the conference, and that the matter ought to be settled within one month's time. "We express our full understanding of the difficult situation that ISOCARD faced following the decision of its Moroccan partners to locate the event in Western Sahara. We have today thanked ISOCARD for a quick and constructive solution to this issue", stated Sara Eyckmans of WSRW. Last month the APPG on Western Sahara met the New Zealand High Commission to discuss the import of phosphates by 2 New Zealand companies. The group called on the NZ government to issue strong guidelines on the trade; it is illegal until the recognised representatives of the Saharawi give consent. 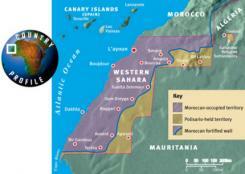 WSRW has published its latest report on the Western Sahara phosphate trade. Morocco shipped over 1.5 million tonnes of phosphate out of occupied Western Sahara in 2017, valued at over $142 million. But the number of international importers of the contentious conflict mineral is waning. For the fifth year in a row, WSRW has published a detailed annual overview of the companies involved in the purchase of occupied Western Sahara's white gold: phosphate. The illegally exploited phosphate rock is an important source of income for the Moroccan government, which holds the larger part of the Western Sahara territory under military occupation. Representatives of the Saharawi people have been consistently outspoken against the trade, both in the UN, generally, and to specific companies. The list presented in WSRW's 48-page report is complete for the calendar year 2017, containing all phosphate shipments from El Aaiun to takers around the globe. The 2017 imports are attributed to six companies in five countries internationally, while about 70 companies worldwide have been identified as owning or operating the vessels transporting the rock to its buyers. A remarkable development of 2017 was the arrest in South Africa of a vessel carrying phosphate rock from Western Sahara to a New Zealand based importer, and the South African High Court placing rightful ownership of the cargo in the exiled government of Western Sahara. The effect on the trade has been remarkable. Three previously long-term importers seemingly sopped buying after this incident, and the usual shipping routes have shifted to avoid Cape of Good Hope and Panama. Stockholm, April 28, 2018 (SPS) - Representatives of Swedish political parties called Thursday on their government to implement the recommendation that had been approved by the Swedish Parliament calling for recognition of the Saharawi State, during a debate on the situation in the Middle East and North Africa. Representatives of the Swedish Left, Democrats, Central and Green parties, addressed various aspects of the decolonization of Western Sahara, and unanimously agreed that the time had come to put an end to this long-running dispute by enabling the Saharawi people to exercise their legitimate right to self-determination and independence. Former AC Milan star George Weah’s inauguration as President of Liberia represents a positive association for the club. Weah played there when he won his FIFA Player of the Year award in 1995. The same can’t be said for its involvement in Morocco, where the Italian football club is helping to normalize a decades-long occupation. In early December 2017, AC Milan announced that “passion for football and for AC Milan has now reached the sand dunes of the Sahara desert” with the launch of a new football academy. According to a club press release, the academy is based in the city of “Laayoune, in Morocco.” But the statement from the club makes no mention of the fact that Laayoune is actually the largest city in Western Sahara, a territory that has been occupied by Morocco for decades. The issue attracts little international attention, and the move by AC Milan is another sign of how the status quo has become increasingly entrenched. By opening an academy in Laayoune, and explicitly referring to it as part of Morocco, AC Milan is helping to whitewash the Moroccan occupation. this is a propaganda victory for Morocco, which will no doubt be delighted at having one of world’s most well-known football clubs set up an academy in the city, lending an air of legitimacy and normality to the occupation. AC Milan could simply have opened an academy somewhere in Morocco’s internationally recognized sovereign territory. Instead it has let itself become a willing part of Morocco’s propaganda machine. The club did not respond to a request for comment.